It’s time for another Obama apology – A really heart-felt one this time. 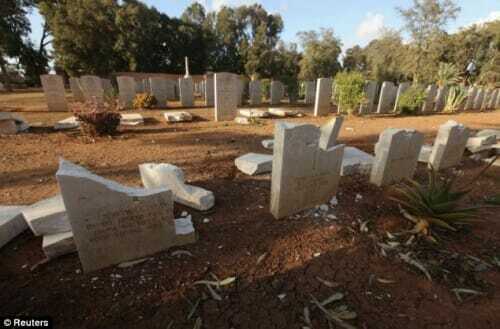 Muslims in Libya desecrated a World War II British Cemetery after Barack Obama apologized for a pile of torched korans in Afghanistan. President Obama has apologised to President Karzai for the unintentional burning of the Korans at NATO’s main Bagram air base after Afghan labourers found charred copies while collecting rubbish. Immediately after news broke of the incident, more than 2,000 furious Afghans – some chanting ‘die, die foreigners’, other throwing rocks – gathered outside the giant US air base at Bagram, 40 miles north of the capital Kabul, as reports of the burning spread. Military sources said that books were removed from the library of a nearby detention center because they contained extremist messages. Prisoners had been writing in the books as way of communicating.